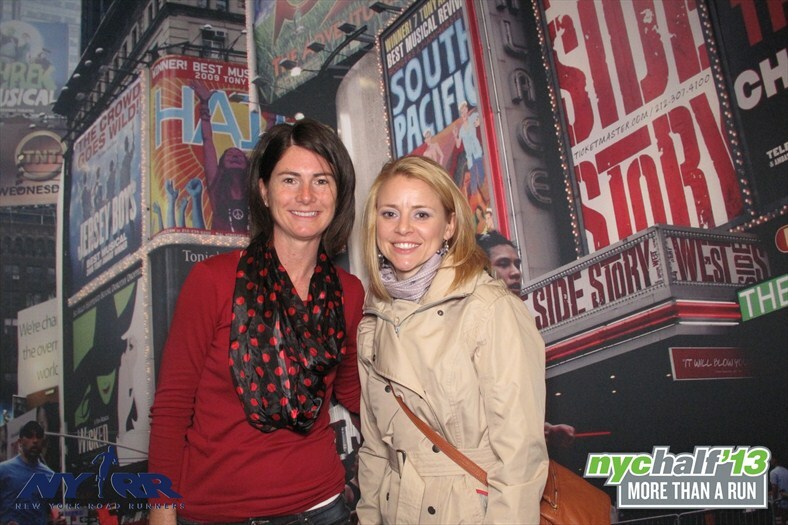 I was so excited to arrive in New York City for the NYC Half Marathon on Friday evening with my running partner. The drive from NH wasn't bad at all and Daisy easily got us to the hotel. After checking in we had a late dinner at a little pizzeria down the block near Radio City Music Hall. On Saturday we grabbed a quick breakfast from the Gourmet Deli across the street from the hotel and then walked to the expo. Even though we knew we were looking for the Penn Plaza Pavilion (which by-the-way is NOT in Penn Station), we were both expecting to see expo signs to help us with the NYC address of 401 Seventh Avenue at West 32nd Street - no such luck. So, it was a little difficult, but we finally found it. I learned from Daisy that just a few years ago, this race did not have an expo at all. That might explain its small size. The expo may not have been as large as I was expecting, but it was sufficient. We picked up our bibs and shirts, and then browsed the vendors serving the usual runner needs of clothing, shoes, nutrition and recovery, along with some souvenir items. One fun part of the expo was the free runner photos. Jump in, snap a picture, print it out, and then email it to yourself if you want. These photo opps are always fun. We were on our way out when I spotted a familiar face from nycrunningmama! It was so nice to finally meet Michelle in person. It was a 530 wake up on Sunday morning to get out the door for the race. We grabbed some breakfast from the deli again, and then made our way to Central Park. It was pretty easy getting there, just follow the runners, but it was freezing! For a race hosting over 15,000 runners the pre-race process was super organized. Runners had the option of dropping provided bags at the designated gear check on Fifth Avenue before entering the park and heading to corrals. We had to be in our corrals by 7AM, so we made our way through the park toward the start area. Each corral had its own set of approximately 20 port-a-potties which meant no line, no waiting. I was glad that I brought a throw-away sweatshirt (courtesy of my husband) to wear over my Nike half zip because with the windchill the temp was 20 degrees. I should have brought a throw away hat and gloves too. After listening to some fun music, they introduced the elite runners, local favorites, and then the National Anthem to start the race. It took 15 minutes for us to cross the start line! The first half of the race was a loop around Central Park. Running with the crowd helped me be patient and let my legs warm up for the park hills. First half splits: 9:09, 8:49, 8:31, 8:46, 8:49, 8:29. Just after the 10K split, the course exited the park on Seventh Avenue. The wall of spectators cheering from the sidelines was the most deafening and incredible experience. I felt like a rock star coming out of the park. I paused on the side to grab some Cytomax, take a quick picture, and look for Daisy. We somehow got separated around mile 5. When I didn't see her, I figured she had already passed by. The next couple of miles literally flew by. These were some of my fastest of the race and I remained in awe of the spectators, the music, and of course Times Square. After passing through Times Square, the course took a right on 42nd Street for about a mile and then turned onto the West Side Highway for the remaining stretch to the finish. It was at the u-turn that I finally saw Daisy (which was a relief to know that we were close to each other). At mile 9 I started playing the mental game. Only 4 more miles to go. Then at mile 10 I was thinking, just a 5K left. I tried to focus on the sites I was expecting to see along the Hudson River waterfront, such as the WTC and Statue of Liberty. With less than a mile to go and feeling a sense of urgency to get to the finish, the course headed into the Battery Park Underpass Tunnel. The tunnel was fun as runners' and spectators' cheers and shouts echoed off the tunnel walls. The fun ended when I realized I had to climb out of the tunnel and to the finish line. Second half splits: 8:17, 8:03, 8:54, 9:12, 8:45, 9:06, 9:45. Everything about this race was organized, including the finish line area. After being handed my medal, I was directed to the finisher's photo line where I texted my husband and Daisy, and then waited for her. We had our photo taken and then continued our exit. On our way to claim Daisy's gear bag, someone handed us our recovery bags and mylar blankets: two things I needed because my Simple Hydration bottle was empty and I was freezing again. The recovery bag was much appreciated because everything was already in it: water, Gatorade, apple, pretzels. More races need to do this! I went into this race fully intending to have fun and take a bunch of pictures. 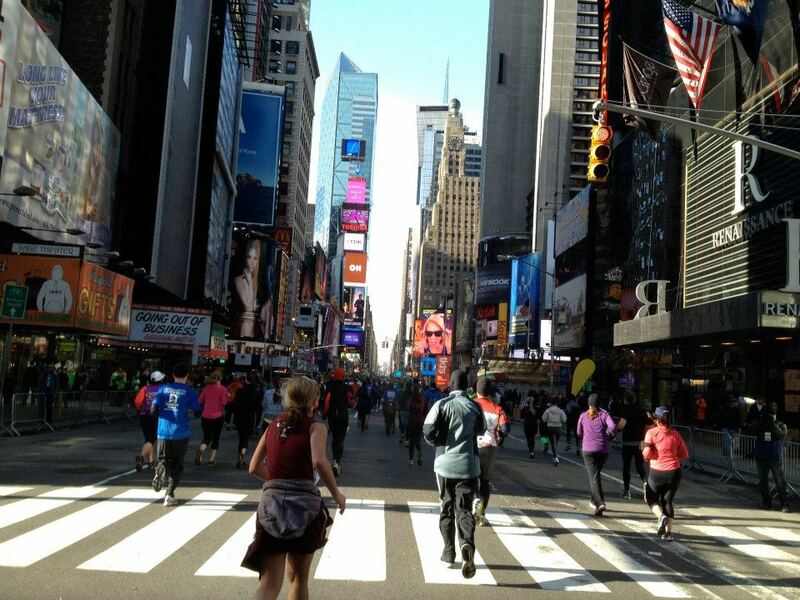 I had a blast while running thanks to the amazing NYC spectators, volunteers, and entertainment. If it had been warmer and I knew WHAT to take pictures of, I would have taken more. There was just so much to see; I admit that I was a little overwhelmed. I found some great course photos by another blogger here. Needless to say, I was completely surprised to see my finish time and a brand new PR! And I love that the NYC Half Marathon had its own app that runners and spectators could use before, during, and after the race. From NYC Half '13 App. Once we made our way through the crowd we stopped at the NYRR tent. I wanted to buy this really cute tee, but the CC system was down and I didn't have enough cash without giving up my subway fare. We waited for as long as we could stand in the cold and spare since we had to check out of our hotel by noon. Sadly, to order online I'd have to spend $14 to have it shipped. LOVE the recap. COVET and JEALOUS you got to see the NYC RUNNING MAMA TOO! Congrats!!! Love all of your pics. Sounds like a fun and well organized race! Congrats on your PR! way to go that's awesome! Congrats on the PR! Your pictures are great. :) I'm surprised that it doesn't look too crowded - I am scared of really crowded races, but running in NYC sounds really fun so maybe I should do it! Yay!! Way to go, Amy!! That sounds like a tough course to pr on, too... awesome job! Congrats on your PR Amy!! That's so awesome. I would love to run this race one day. Sounds like you had a great time! Thanks for the link to my pics and congrats on the PR! I guess as a NYer and someone who participates in a lot of NYRR races, I forget how well organized they are as I've come to expect it. I guess I'm spoiled :-) Happy running! Congrats on the PR! That is so great! I also find great relief in realizing there's only a 5k left once I've reached the 10 mile mark. 5ks are totally doable! Looks like a great race. I hope to do it next year! Congrats! What a great day/weekend for you. So fun that you got to meet Michele! Congrats on your PR. I would love to do this race or the NYC Marathon one day. They sound so amazing! It was so cold! I thought I would get frostbite walking to the subway after! Super organized - more races should look at how NYRR does it. It did feel crowded at the start (not in the corral though), and definitely at the finish, but the rest was pretty roomy. The finish line party was crowded and considering how cold it was, I bet fewer people were there than on a warmer day. But there was definitely places to spread out during the race. You should do it! Thank you! I am so glad that I did it. It was so much fun! Thanks Eric. I've put the Hero3 on my wish list! I love meeting my virtual runner friends IRL! It was amazing! I could see myself doing it again (if anyone asked me to)! What a view! And What a PR!! YAY!!! Looks like a fabulous race weekend! !